The mass of the Moon is about 1% that of Earth. That might seem pretty small, but it’s actually surprisingly large. The moons of other planets are tiny when compared to their planet’s mass. Just how Earth got such a large moon has been a bit of a mystery, but it has generally come down to two models: co-formation and collision. The co-formation model is the idea that the Earth and Moon formed in the same region at the same time. Analysis of lunar rocks from the Apollo missions have found that the Earth and Moon have the same chemical composition. Oxygen isotopes from Lunar and terrestrial rocks are basically identical, for example. Other solar system bodies such as Mars, and other asteroids have different oxygen isotopes. This means that the Earth and Moon must have a common origin. The Moon didn’t, for example, form elsewhere in the solar system to be later captured by Earth. The collision model posits that during the formation of the solar system proto-Earth collided with a Mars-sized planetoid sometimes named Theia. Part of the mass of Theia was captured to become Earth, and the remains formed a debris ring around Earth, much of which coalesced to form the Moon. This model is supported when comparing the densities of the Earth and Moon. The Moon has a density about 60% that of Earth, which is exactly what is predicted by the collision model, where the lighter outer layers of Theia and proto-Earth are scattered to the debris disk, while the heavy core of proto-Earth remains. If the Earth and Moon had formed in orbit as separate bodies, their densities should be much more similar. Generally the collision model has been the more popular one, partly because of the differing densities, but also because an early collision seems much more likely than the co-formation of two large rocky worlds. But one sticking point with the collision model has been that the geology of the Earth and Moon are actually too similar. If the collision model is correct, there should be some clear difference between the composition of the two bodies. But the oxygen isotopes from lunar rocks, for example, were indistinguishable from those of Earth. Now a new paper in Science has reexamined some rocks gathered by the Apollo missions. Using a new method, the team was able to measure the oxygen isotopes in the rocks to a much greater precision than before. What they found was that the level of Oxygen 17 in lunar rocks differed by about 12 parts per million from similar Earth rocks. 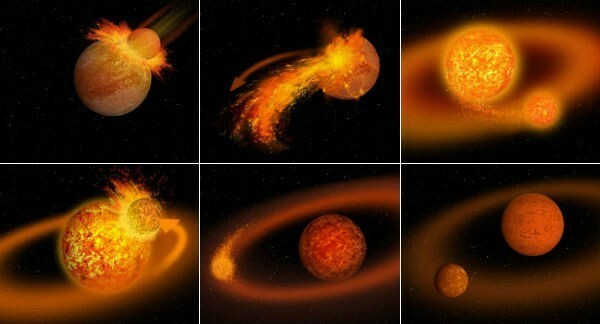 While that isn’t huge, it is different enough to indicate that the Moon did indeed form as the result of a collision rather than co-formation. The team goes on to show that similar levels are found in a rare type of meteorite known as E-type chondrite, which hints at Theia being having such a composition. This result couldn’t have been obtained without rocks taken directly from the Moon. Who knows how much more we’ll learn when we get back there.